If you haven’t noticed by now, Rukka, the Finnish kings of cold and wet weather, pride themselves on using only the most advanced materials in their garments. Their market originated in Northern Europe, a place where motorcycles are just as common as cars, and commuters have very little choice but to ride year round. When your layering system is essentially the climate control of your vehicle, choosing these high-performing textiles is a worthy investment. The admittedly oddly named Rukka Kim Shirt is a crazy versatile mid-layer that makes use of OutLast fabric - a temperature regulating fleece that is way more technical than your average moisture wicking layer. I first came across OutLast in the lining of the Rukka Imatra gloves. OutLast uses what they call “Thermocules” embedded in the fibers of the garment to actively absorb, store, and release excess heat. As the skin gets hot, the heat is absorbed, and as it cools, that heat is released. Trust me, this all sounded like a marketing gimmick to me until I actually wore those gloves all winter long last year. I wore them on both frigid night rides home, as well as unseasonably warm and rainy afternoons where temperatures creeped well outside of the typical range for the dead of winter. My hands felt completely ‘neutral’ the entire time - never too hot, never cold. That is exactly what you are getting in the Kim mid-layer. This is insulation when your core needs it, and a moisture-wicking, cooling sensation when it doesn’t. 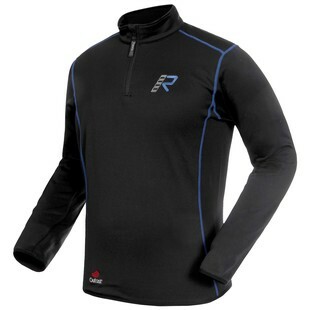 Pair this with your summer riding jacket to stretch it into colder months, or bolster a cold-weather jacket into a winter powerhouse. Rukka knows it is not worth messing around with anything but the best.